Advantages: Comprehensive photo coverage; otherwise neglected subject area; logical structure by nationality of users; line drawings, scrap views and tables enhance the text; attractive colour profiles; colour walkaround section. 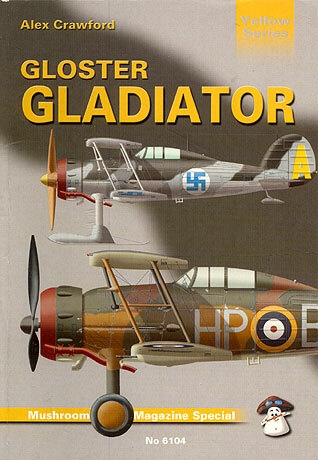 Mushroom Model Publication's latest book is "Gloster Gladiator" by Alex Crawford. The book comprises 144 pages in 9.5" x 6.5" format, with soft covers and including a sixteen page colour profile section and a further eight pages of colour walkaround photos. After a brief introduction, the body text describes the Gloster Gladiator in RAF and Commonwealth service. The description commences with the introduction to Squadron service in 1937 after the first Spitfire and Hurricane had already flown. Despite this surprising situation, the Gladiator a front-line fighter with the RAF until early 1939. The RAF section follows the Gladiator's operations through the Munich crisis, the Phoney War, the defence of Egypt, Greece and Crete, East Africa, Iraq, Syria, the Far East and its retirement to second-line duties. Camouflage and markings are summarised over two pages. The Sea Gladiator is covered in a separate section. The remaining half of the book is devoted to the many other operators of this significant fighter, including Belgium, China, Egypt, Finland, Free French forces, Germany, Greece, Iraq, Ireland, Latvia, Lithuania, Norway, Portugal, the USSR and Sweden. The text is rounded out with Appendices listing Gladiator survivors, claims and losses, and technical data. Each country's section is generously illustrated with photographs. The text follows a common format - discussing the introduction to service and operations followed by a summary of camouflage and markings. The text throughout is clear, concise and logically organised - just as well considering the breadth of the subject matter. My only criticism is that the book's format dictates that many of the photographs are quite small. Some photos are also darkly reproduced, making it difficult to discern details. The twelve page colour profile section includes 28 paintings of Gladiators in the service of many different countries. It is nice to see some full-page side profiles, and other subjects being depicted in four-views. 44 colour photographs are included in the walkaround section. Various Gladiators are photographed, including one aircraft under restoration. This machine reveals rare airframe details. There are also good quality photos of the interior of the Gladiator. This book is a wonderful resource for the aircraft modeller or the aircraft historian.